The unauthorized immigrant population in 2016 consisted of 5.5 million men, 4.5 million women and 675,000 children. The number of unauthorized immigrant adult men declined by about half a million since 2007, while the number of women did not change. The number of unauthorized immigrant children also declined by more than half. The number of unauthorized immigrant men declined mainly because of a sharp decrease over the decade in those ages 18 to 44. The number of unauthorized immigrant women ages 18 to 44 also declined, but not as sharply. By contrast, this age group grew modestly from 2007 to 2016 among the U.S. born and lawful immigrants. 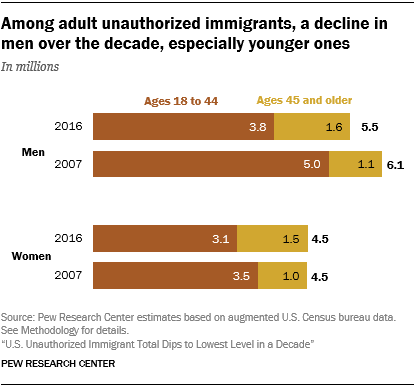 The number of unauthorized immigrants ages 45 and older grew, among both men and women, mainly because of population aging and not from new arrivals of older unauthorized immigrants. The majority of all unauthorized immigrants (54%) were male in 2016, compared with about half of legal immigrants (47%) and the U.S. born (49%). Unauthorized immigrants are somewhat less likely to be male than in 2007 (57%). Among adults, the unauthorized immigrant population is younger than other groups. Nearly two-thirds are ages 18 to 44, compared with four-in-ten legal immigrants and about a third of people born in the U.S. Only 1% of unauthorized immigrants are 65 or older, far lower than for other groups. Unauthorized immigrants live in 5.2 million U.S. households that include a total of 20.2 million adults and children. Most of the 9.5 million other people who live with unauthorized immigrants are U.S.-born minor and adult children. Reflecting their relatively young ages, unauthorized immigrants are more likely than other groups to head households with children. 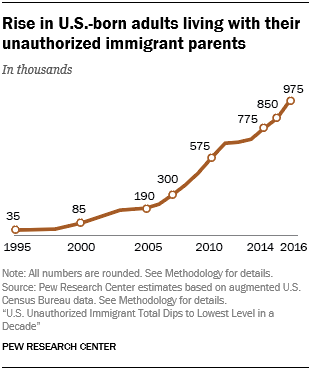 About four-in-ten households headed by an unauthorized immigrant, spouse or partner (43% in 2016) are two-parent households with children, higher than the shares for U.S.-born household heads (18%) or lawful immigrant heads (32%). Unauthorized immigrant households also are increasingly likely to include U.S.-born adult children. The number of U.S.-born adult children living with their unauthorized immigrant parents has more than tripled since 2007, as minor children have grown up. The share of students with at least one parent who is an unauthorized immigrant varies widely from state to state. States with the highest shares include Nevada, where they were 20.2% of students in 2016; Texas, 13.3%; and California, 13.3%. At the other extreme, these children make up fewer than 1% of students in Alaska, Maine, Montana, Vermont and West Virginia.